The Nuclear AMRC’s newest and largest machining centres are now available for collaborative R&D, after almost a year of groundwork, installation and commissioning. 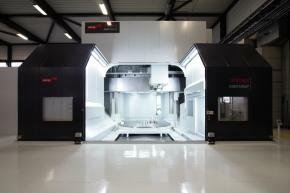 The two machines offer UK manufacturers the ability to develop new machining techniques for very large precision components. Like all the Nuclear AMRC’s workshop resources, they are available for UK companies to use in collaborative R&D to expand their manufacturing capabilities. 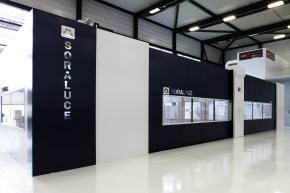 The largest machine by area is a Soraluce FX12000 floor-type horizontal milling and boring centre. The Soraluce is capable of working on parts such as decommissioning waste flasks, pumps, valves, offshore wind turbine hubs and sub-sea components for oil and gas. The machine can complete five-sided machining of complex parts in a single set-up, on parts of up to 12 metres in length and five metres diameter. Alongside the Soraluce is a Dörries Contumat vertical turning/milling lathe (VTL), capable of working on parts of up to five metres diameter and three metres height. It offers full turning, milling and deep hole drilling capabilities for the largest high-value components for the nuclear industry, including full-scale reactor internal parts, as well as offshore well heads and wind turbine hub connectors. The VTL is funded by the High Value Manufacturing Catapult. “The VTL offers unrivalled turning capabilities, but also offers full gantry milling capabilities with five metres of Y-axis travel and a 37kW milling spindle with a multiple head changer,” says Shaw. “Again, these are unique capabilities for a research centre anywhere in the world. Parts machined on the new centres can be verified in-house on one of the largest gantry-type coordinate measuring machines available. The Hexagon DEA Delta is capable of measuring parts of six metres length and three metres width, and weighing up to 15 tonnes. 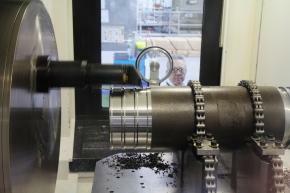 From November, it will be housed in a new vibration-proofed and temperature-controlled CMM extension to the main Nuclear AMRC workshop, allowing it to work to maximum precision. 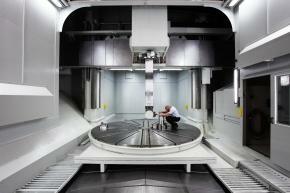 Find out more about our machining R&D capabilities. For more on our latest workshop capabilities and other developments, see our new Q4 newsletter. The Nuclear AMRC has joined forces with the Manufacturing Advisory Service (MAS) to help more than 300 small manufacturers prepare to seize the opportunities of the UK’s rapidly developing £60 billion civil nuclear new build sector and £1.5 billion a year decommissioning programme. Fit for Nuclear (F4N) lets companies measure their capabilities against industry standards and helps them bridge any gaps to meet nuclear industry requirements. Backed by top tier partners including Areva and EDF Energy, the initiative offers a business improvement journey that will identify strategy, implement new processes, secure necessary accreditations and provide supplier matching opportunities. For the first time, F4N is also offering participating SMEs the chance to apply for match funding for business improvement or R&D projects. “There is great potential for advanced manufacturing SMEs to build business in the civil nuclear sector,” says Steven Barr, head of MAS. “Following approval for Hinkley Point, we can expect these opportunities to increase in new build, as well as in decommissioning and existing station maintenance. To date, around 150 companies have completed the online Fit for Nuclear assessment, with the majority receiving ongoing support and development from the Nuclear AMRC team. New funding from the government’s Regional Growth Fund, through the civil nuclear Sharing in Growth programme, has opened the initiative to another 300 SMEs. MAS will help the Nuclear AMRC engage the wider manufacturing supply chain, including control and instrumentation, electrical and other sub-contractors. F4N participants can also take advantage of the Nuclear AMRC’s Nuclear Connections initiative, which helps link manufacturers to specific supply opportunities from the industry’s top tiers. This is based on a detailed understanding of the production capabilities of individual companies and matching these to current and upcoming tenders, including the Nuclear Decommissioning Authority’s estate. 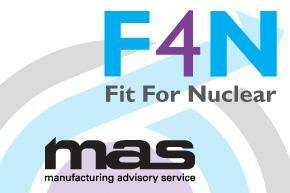 “At little or no cost to the participating company, F4N can deliver real business value regardless of your current nuclear sector knowledge or experience,” says Martin Ride, an experienced purchasing manager with Rolls-Royce, now working as supply chain consultant at the Nuclear AMRC. The Fit for Nuclear journey starts with a capability questionnaire and online assessment, which will then be followed by a site visit from a dedicated F4N assessor. They assessor will help the company develop an action plan that will be verified by industry experts. A nuclear specialist will then work with the company to ensure they’re in the best position to win work. Any English SME can apply for match funding, subject to reaching the required stage in the Fit for Nuclear journey, with the average grant expected to be around £10,000. EDF Energy has cleared a major hurdle for its proposed new nuclear power station at Hinkley Point, after the European Commission approved the UK government’s plans to support its construction and operation. The Nuclear AMRC welcomed the news as a significant step forward in the UK’s new build programme. 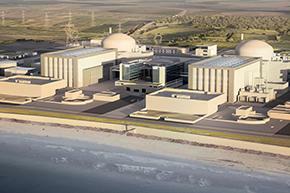 The European Commission review focused on the commercial terms agreed by EDF and the UK government last October, under which electricity from Hinkley Point C will receive a guaranteed strike price under the contract for difference (CFD) regime, to make sure that they were permissible under the strict rules on state aid for commercial ventures. During the review, the government agreed to modify the terms of the project financing to preserve competition in the energy market. Ultimately, the state aid examiners were satisfied that the support was necessary to address a genuine market failure. The revised terms include an increased initial guarantee fee to be paid by EDF to the UK Treasury, which will reduce the subsidy by over £1 billion; and a new mechanism to share the profits of the project with UK taxpayers. Once EDF’s return on equity exceeds an agreed level, any further gain will be shared with the Treasury through a reduction of the strike price. The strike price will be reduced further if profits exceed a second higher threshold. This gain-share mechanism will last for the entire 60-year lifetime of Hinkley Point C. Any savings in construction costs will also be shared with the Treasury. According to the Commission announcement, Hinkley Point C will have a capital cost of about £34 billion including £24.5 billion construction costs, and require debt financing of £17 billion. EDF Energy executives, speaking at the group’s supply chain conference at the Nuclear AMRC earlier this year, identified the state aid review as the main challenge for its new build programme. NuGen said that it was given confidence in taking forward its plans for the Moorside project. Both groups will have to undergo a similar state aid review as and when they strike CFD agreements with the UK government. Agneta Rising, director general of the World Nuclear Association, said the UK’s strategy for electricity market reform was an innovative approach to encourage investment in a deregulated market. “The decision will be welcome by all those planning new nuclear build projects in the EU and similar markets,” she said. 27 November, AMRC Knowledge Transfer Centre. The Nuclear AMRC with partners Mazak and Sandvik Coromant invite companies to see the state of the art in large-scale high-precision manufacturing for the oil & gas sector. Many of the Nuclear AMRC’s capabilities and production-scale facilities are ideal for addressing manufacturing challenges in oil & gas. Our engineers and researchers are working with technology providers including Mazak and Sandvik Coromant to develop new tools and techniques for the most demanding applications. This exclusive showcase event will include presentations from some of the most innovative manufacturers and technology providers in the oil & gas sector, including Siemens and Plexus. Mazak Orbitec 20, offering unique turning and facing capabilities for irregular parts. Some of the world’s largest R&D machine tools, including vertical turning/milling lathe, horizontal boring and deep-hole drilling centres. 15kW diode laser cladding cell. For more information, download the flyer (pdf). 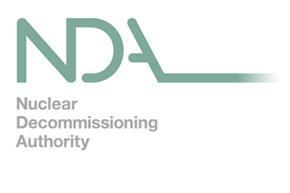 The Nuclear Decommissioning Authority presents the UK’s largest decommissioning supply chain event, with over 1500 delegates expected on the day. NDA Estate Supply Chain Event 2014 aims to highlight opportunities along the supply chain, particularly for small and medium-sized businesses, and will include presentations from the NDA, site licence companies and key government speakers. This year’s event also features UKTI and the Ministry of Defence. See our nuclear decommissioning intelligence page for more information on the opportunities for manufacturers.